Search engine optimization (SEO) gets a bad rap among bloggers. On one hand, search engines are one of the top traffic generators for most blogs. But on the other end, there’s a false belief that writing “SEO optimized content” means stuffing keywords into paragraphs and headers, resulting in barely readable blog posts. However, that’s not what SEO is about. At its most basic level, SEO is about showing search engines like Google and Bing that your blog is a relevant resource for people searching for information about your topic/industry. Figuring out how to relay to search engines that your website is relevant to different queries is where a lot of bloggers and marketers get lost. This can eventually lead bloggers to tactics that could potentially harm their websites. There are always new SEO tips for bloggers popping up around the Web. It’s even more difficult for new bloggers to get a grasp of what they’re supposed to do when it comes to getting content to show up higher in search engines. It seems like the go-to tactics are popular one day, and become absolutely toxic a few months later. Despite several changes to the algorithm Google uses to determine where your content will rank for different queries, the best practices for SEO have remained fairly consistent over the years. If you can stick to these concepts and tactics, you’ll be much more confident. No one wants to be the anxious marketer having sleepless nights because of rumors of Google updating Panda or Penguin on Webmaster. When “SEO content” became a buzzword, we started to see some pretty big drops in the quality of writing from bloggers. They were starting to write specifically for search engines (robots) instead of people. Unfortunately, some bloggers still write this way today. But luckily it has gotten a lot better, especially after the Hummingbird update and the trend toward voice searches. The Hummingbird update was created to help Google better understand the intent of searches. For instance, if you were to Google “places to get burgers,” Google would interpret that as meaning you’re looking for local restaurants. This impacted SEO because search engines are catering toward answering questions and semantic search, rather than just being focused on keywords. Think about it. When you use Google, Bing, YouTube or even Siri, you’re usually looking for the answer to a question. Take that concept and apply it to your blog. Your content should be written in a way that answers your target audience’s specific questions. Your blog should not just be a place to rank for a specific keyword. Shift your focus away from thinking about keywords, and more toward providing content that solves the problems of your target audience. You can use Quora, forums, social media and other resources to find out what your audience’s struggles are. Then provide the solution with your blog. Getting other websites to link to your content is still one of the strongest search engine ranking factors according to data from Moz. Over the years, bloggers have tried everything from spammy directory sites to buying links from low quality blogs in order to get as many links pointing to their website as possible. As search engines began to penalize sites engaging in “black hat” link building tactics, bloggers were forced to become more creative with how they got backlinks from other sites. We hate to break it to you, but there is no magic secret to link building. The one strategy that has stood the test of time is building relationships. People link to sites they trust. Start by making a list of websites, influencers and authorities in your industry. Then think of ways you can get on their radar, usually by offering some type of value to them. For instance, you could include authorities in a blogger roundup post, or engage with popular websites on social media. After you start to form a relationship, they’ll be much more likely to link to your content on their own site. You could even work together on future projects that would put you in front of a wider audience while earning a backlink or two in the process. Even if you don’t get a backlink, just getting influencers to start sharing your content will have a huge impact. 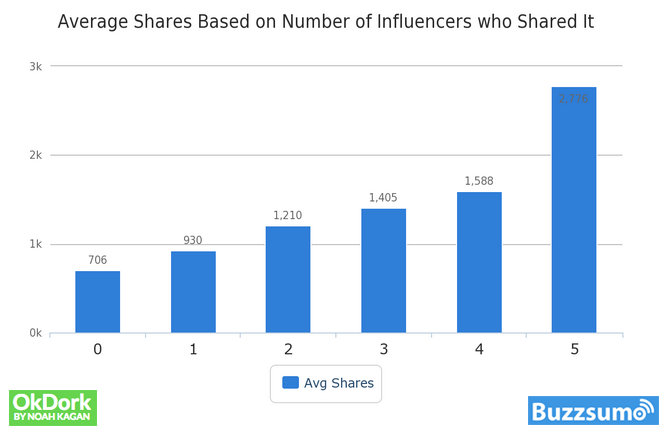 Having just one influential person share your content can result in 31.8% more social shares. 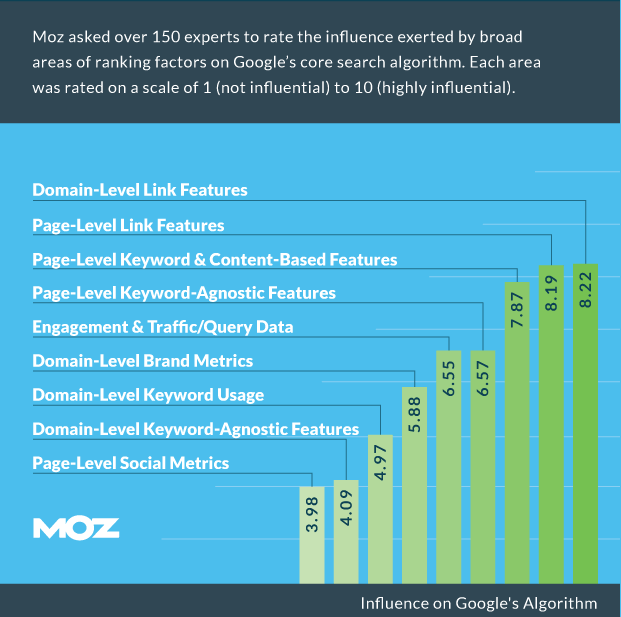 In the same Moz study mentioned earlier, the second-most important ranking factor was on-page optimization. The great part about on-page SEO is you have a lot more control than off-page factors like backlinks. There is a lot that goes into on-page SEO, but you don’t have to be extremely technical to get started. Just doing the basics will put you ahead of the game. SEO friendly URL’s: The URL for your website should clearly show what the page is about. Let’s say you had a blog post about the best ugly Christmas sweaters. Instead of “www.yoursite.com/p=382”, it should be “www.yoursite.com/best-ugly-christmas-sweaters.” Keep your URL limited to roughly 2-5 words and include your target keyword. Meta title: A meta title helps search engines determine the main topic of a page. It’s what shows up at the top of your browser, and also in search results. Include your target keyword in your meta title, but keep it natural. No keyword stuffing! H1 tag: Every page on your site should have an H1 tag. It’s the headline of the page. If you use WordPress, then the post title will automatically be given the H1 tag. However, sometimes certain themes will override this feature so it’s always nice to do a double check. Subheadings: In addition to the H1 tag, you should also use subheading tags like h2 and h3 to clearly structure your posts. The subheadings make it easier for readers and search engines to navigate your content. Images: Adding multimedia in your posts makes them more visually appealing. When it comes to optimizing your images, one of the most important tasks is setting an alt tag. Since search engine bots don’t see visuals and only text, alt tags allow them to know the content of an image. Your alt tags should describe the images you’re adding. Outbound links: Adding links to relevant content within your posts helps search engines better understand what the topic of your content is. Not only that, but you can reach out to sites you link to and build a relationship. In turn, they might share your post with their audience. Internal links: If you’ve been blogging for a while, you should have a solid library of content that you can interlink. Adding internal links (links from one of your posts to another post on your site) helps search engines better understand the topic of your blog content, and keeps people on your site longer. Usability: It sounds simple, but so many bloggers overlook the importance of having a site that functions correctly. Do all of the images in your content work? Are there broken links? Does your content load quickly? All of these factors affect user experience, which is very important for on-page SEO. We’ll go over some different tools to help you check and fix any potential usability issues on your site in tip No. 6. Those are some basic steps you can take to improve your on-page SEO. The goal is to make it easier for search engines to understand the topic of your content. The more relevant your content appears to be, the better chances you have of ranking highly in search engines. Remember back in grade school when the teacher would give you a warning when you did something wrong? That warning was your chance to straighten up your act and get back on track to avoid being punished. Well that’s kind of what Google Webmaster Tools is for your blog. The beauty of Webmaster Tools is it doesn’t just tell you what’s wrong with your site, but also how to fix it. There is an extensive knowledge base of articles and a forum to help you take care of any issues Google finds with your blog. Getting setup is simple. Just go to www.google.com/webmasters. If you already have Google Analytics installed on your site, it’s as simple as connecting the accounts. Check your Webmaster Tools on a regular basis to make sure everything is working correctly. While Google relies on algorithms to determine where websites rank in the search results, it also uses humans to manually review the quality of the websites that show up. Whether it’s good or bad criteria about a site, Google tells these manual reviewers to judge a site on its Search Quality Evaluator Guidelines. Up until recently, that book has been unavailable to the public. The book is over 150 pages long, and jam packed with great information. One of the key takeaways from the guide was the importance Google puts on authority. There are several mentions of E-A-T, which stands for Expertise-Authoritativeness-Trustworthiness. Your content should show that your website or the people contributing to the content on your blog, are credible and have some level of expertise on the topics being covered. Authoritative content doesn’t necessarily just mean being written by a well known person. Crafting a piece of content that is the best resource on the topic could qualify. For instance, if you wrote an in-depth blog post about how to install a graphics card in a computer, and it has more detail and information than a post on a more well known site, your content could still be more authoritative. As you start creating more great content and networking, your blog will start to get mentioned around the Web, which will help build your authority even more. On-Page SEO: Manually trying to ensure that you hit everything on the on-page optimization list we mentioned earlier can be tedious. Luckily, these tools can handle the dirty work for you. Link Building: As we mentioned, getting other sites to link back to you is one of the top search engine ranking factors. You shouldn’t use automated link building software, but these tools make it easier to find new opportunities to earn genuine backlinks. Content Creation: Not only do you need to target the right keywords, but you also need to write about topics of interest for your audience. Coming up with new ideas for content is a lot easier with these tools. All-in-one Tools: In addition to these tools, you can also consider using these all-in-one tools that perform several different SEO related tasks. A linkable asset is a unique, extremely useful piece of content that’s so valuable people can’t resist linking to it. It’s like when you go to an amazing restaurant vs. going to one that’s just ok. You’re going to go out of your way to tell everyone about the amazing restaurant, but you’ll probably only talk about the one that was just ok if someone asks if you’ve been there. A great example of a linkable asset it the ProBlogger job board. It’s a great resource for freelance bloggers looking for paid writing gigs. The page is constantly linked to in blog posts about how to make money blogging or paid freelance writing sites. Why? Because it’s unique and extremely valuable. Before creating your linkable asset, look at the top-ranking content for similar topics. Your goal is going to be to make something even better. After you form your linkable asset, the next step is to spread the word. Try these five content distribution techniques to start promoting your new asset. Hopefully these SEO tips have given you a new outlook on how to use search engines to get traffic for your blog. You don’t have to be a Web developer or have 15 years of experience with SEO to optimize your site. Focus on creating awesome content (with proper on-page SEO) and building relationships. The next time you start writing a blog post, keep these SEO tips in mind. You might be surprised by how much of an impact these changes have.